It seems like every time I turn around, I see a new face! I want to give a huge thanks to all of you, as most of these new peeps are referrals from y’all! Thanks for spreading the word about how awesome our gym is, and remember that our Living Social deal for new clients is available for a few more days – a perfect gift to get your friends or family kickstarted. Click here to view the deal. I LOVE retesting workouts. It lets me see how far I’ve come or where I’ve slacked off a little. This HQ WOD is a great burner. The 2:1 work:rest ratio ensures that you push hard the whole way. 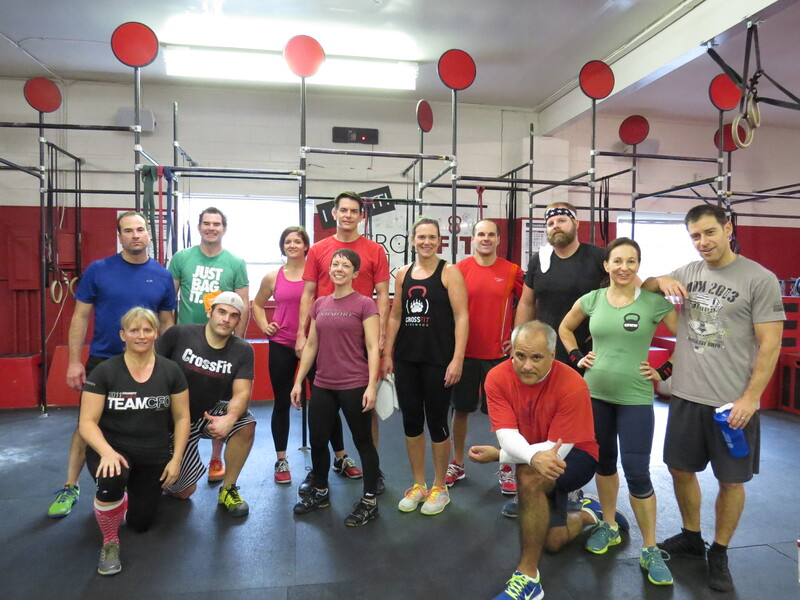 From power cleans and burpees, we went to overhead squats, situps, and double unders. Another workout with built in rest. These are definitely my favorite!! I only have to focus on a little bit of work before I get a break. Super fun! So, the question is: Which is harder – chest to bar pullups or toes to bar? Front squats or back squats without a rack? I think the general consensus was that this on got the quads screamin’!! Next up was a spicy Monday WOD. Here, I have to vent a little. When I program these workouts, I’m always thinking of the BEST athletes in the gym. How do I make this workout hard for them? Then, we scale from there. So, when I was programming a lunge/burpee wod, I thought, “obviously, this will take LT 8-10 minutes.” Wrong-o!!! LT SMASHED this workout!!! All week long, I heard how hard this workout was. Still – LT managed to finish in just over 5:30. Thanks for raining on my parade, LT! Moving on… I’m sure Tuesday’s WOD had you wondering what was up with the crazy numbers! It was a 10-8-6-4-2 C&J with 2x Box Jumps and 3x Air Squats. Crazy numbers. Just finishing the right number of reps was a win on this one. And what is better than a static hold with a kettlebell? We certainly saw some interesting techniques! Awesome week everyone!! Keep up the good work, and make sure to introduce yourself to the new peeps!! ← Turkey Day Run Info! !